Archaeopteryx is a big word that simply means “ancient wing.” It refers to a set of fossils of a strange-looking extinct bird. Books promoting evolution often show pictures of Archaeopteryx. Its beak had small teeth, so many scientists see it as playing a lead role in an unthinkably long plot about reptiles evolving into birds. Others admit it was just a bird. New research places Archaeopteryx more firmly in the bird category than ever before. A study published in Historical Biology showed how new technology helped produce 3-D images of Archaeopteryx bones.1 News articles called Archaeopteryx a “missing link.”2 Either birds like this evolved from reptiles naturally, or God created reptiles and birds supernaturally. Can the 3-D scans help decide between these two options? The research team compared the shapes and surfaces of every scanned bone similar to the way an automotive engineer compares the many shapes and surfaces of a race car’s engine parts. They focused on one of the 12 known Archaeopteryx fossils called the Daiting specimen. This sample has small differences from the other fossils and was buried after the others in a higher rock layer. The researchers said it looked a bit more like modern birds than did other Archaeopteryx fossils. Image credit: Zhao Chuang/Peking National Science Organization, via American Museum of Natural History. Adapted for use in accordance with federal copyright (fair use doctrine) law. Usage by ICR does not imply endorsement of copyright holder. Let’s track this logic. 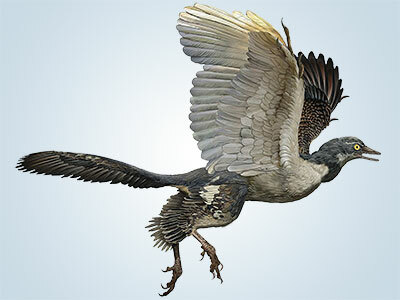 First, researchers assume Archaeopteryx was evolving. Then they find that the Daiting specimen could probably fly a little more smoothly than other Archaeopteryx variations. Finally, they conclude that the Daiting specimen shows bird evolution. Synchrotron X-ray microtomography scan of the Daiting Archaeopteryx jaw shows eight upper teeth. Other specimens had 11 or 12 teeth. Red areas show replacement teeth. Image credit: Copyright © 2018 Taylor & Francis Group. Used in accordance with federal copyright (fair use doctrine) law. Usage by ICR does not imply endorsement of copyright holder. Any problem with this argument? Yes! It ends with the answer it had already assumed. All creatures have variations. For example, among the dog kind German shepherds have a stronger bite force than Labradors.4 Imagine 20 fossilized dog skull variations. Experts could line them up in order of weakest to strongest bite features, then call it evolution. But we know that these dog skull varieties belong to just one dog kind.5 They show variation within kind but not evolution between kinds. In the same way, subtle Archaeopteryx bone shape varieties could all belong to just one Archaeopteryx kind. God made Archaeopteryx, just as He made all other created kinds. One last question about these new research results: Why would a better flyer make an extinct bird more like modern birds when many modern birds can’t even fly? Penguins, kiwis, and kakapos live just fine without flying. 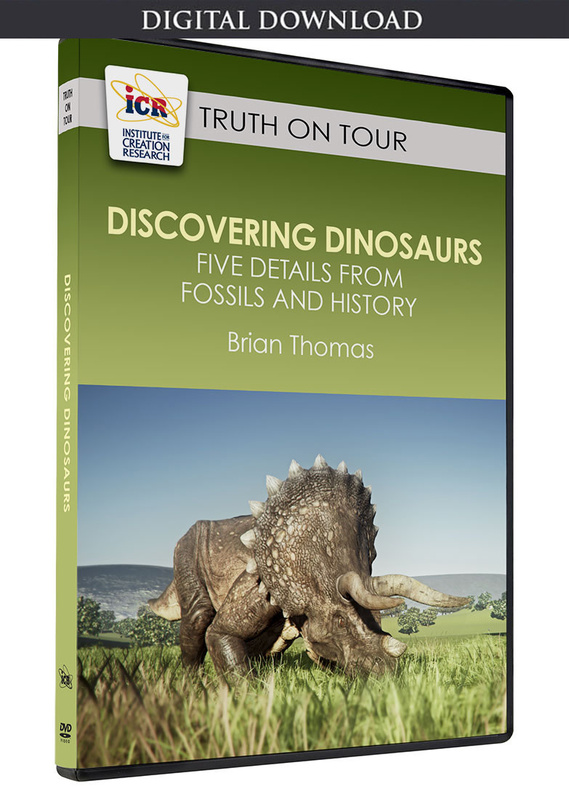 Their features suit various modes of life, not various stages of some imagined evolution. Designed variations in the Archaeopteryx kind could have tuned its flight efficiency to enable it to move and live in different areas. That would mean it didn’t evolve at all. God made Archaeopteryx, just as He made all other created kinds. Kundrat, M. et al. 2019. The first specimen of Archaeopteryx from the Upper Jurassic Mörnsheim Formation of Germany. Historical Biology. 31 (1): 3-63. 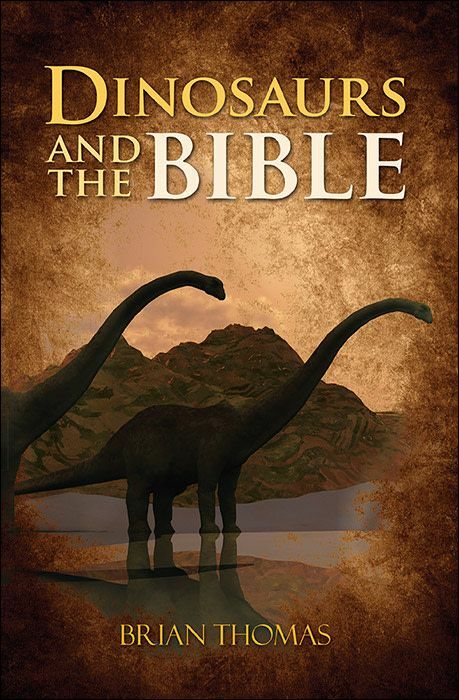 New species of ‘missing link’ between dinosaurs and birds identified. The University of Manchester news release. Posted on manchester.ac.uk October 25, 2018, accessed October 26, 2018. For example, “the ‘modern’ structure of the feathers of Archaeopteryx and their organization into a wing as an airfoil are typically bird-like.” Wellnhofer, P. 2009. Archaeopteryx: The Icon of Evolution. Munich, Germany: Verlag Dr. Friedrich Pfiel, 166-167. Ellis, J. L. et al. 2008. Calibration of estimated biting forces in domestic canids: comparison of post-mortem and in vivo measurements. Journal of Anatomy. 212 (6): 769-780. Guitard, C. J. 2018. Creationist modelling of the origins of Canis lupus familiaris—ancestry, timing, and biogeography. Journal of Creation. 32 (2): 20-28. Cite this article: Brian Thomas, Ph.D. 2019. 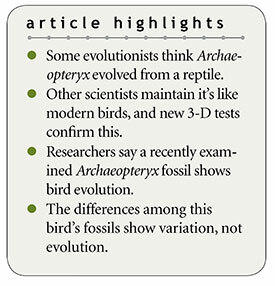 Does Archaeopteryx Show Bird Evolution?. Acts & Facts. 48 (1).